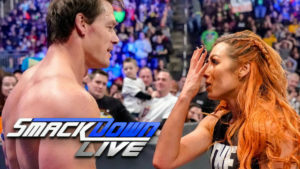 John Cena is confronted by The Man, a fatal five way determines who will get a WWE Title shot a Royal Rumble, and Big E in a diaper highlight a good episode of SmackDown Live. 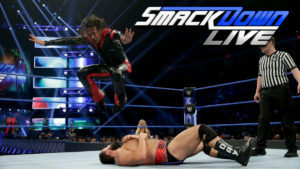 This episode of SmackDown Live was light on wrestling, but it still presented some interesting segments and some fun moments in the ring. The final SmackDown Live before Survivor Series certainly was interesting. It finalized some matches for Sunday while feeling like it changed everything. The men’s and women’s Survivor Series teams are decided on a very entertaining show that also featured New Day vs The Usos, Almas vs Mysterio, Samoa Joe vs Jeff Hardy, and Becky Lynch vs someone we hadn’t yet seen on the SmackDown roster. Though there wasn’t a lot of wrestling or major moments, the last SmackDown live before Super Show-Down was an entertaining show.